1990 life Size Maui and Sons Sharkman Shark Surfer With Surfboard. Large lifesize 7.5' Foot tall Maui & Sons Sharkman Mascot holding a surf board on a sandy beach base. He is made of fiberglass and is fairly heavy, the surfboard is easily detached from stand. I bought him back in the 1990s. Any questions feel free to message me! This Shark will be between 300-700 depending on were you live. Excellent shows very minor size of use. All Vintage and Antique related items are guaranteed to be original period pieces and made by the designer listed. Each item has been appraised and authenticated by one or more antique dealers in the West Los Angeles area. Some items may vary in color or appearance from actual picture. Many of our Modernist items were used as Props in TV and Movies. 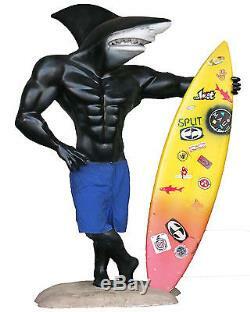 The item "Vintage 1990 life Size Maui and Sons Sharkman Shark Surfer With Surfboard" is in sale since Tuesday, July 02, 2013. This item is in the category "Sporting Goods\Water Sports\Surfing\Other Surfing". The seller is "harveysonbeverly" and is located in North Hollywood, California. This item can be shipped to United States.